Ohio’s ag districts and agricultural security areas are important programs that help preserve farmland in Ohio. To help Farm Bureau members have a better understanding of these programs, OFBF Director of Agricultural Law Leah Curtis has compiled a list of things you should know about these programs. 1. Landowners can enroll in an agricultural district with their county auditor. The land must be at least 10 acres, or if less than 10 acres, have an average gross income of at least $2,500 from agricultural production. While the requirements are the same as for the Current Agricultural Use Value program, a landowner must enroll in each program separately. 2. Agricultural district registration affords important benefits to landowners, including an affirmative defense in certain nuisance suits that might be filed against a landowners for their agricultural activities. Other benefits concern assessments for water, sewer and electric and eminent domain review. 3. If land is in a municipality, the agricultural district enrollment must be approved by the city’s legislative body and the benefits of the ag district program can be modified. 4. Agricultural security areas are an opportunity for a group of landowners and local officials to make a commitment to keeping land in agricultural production for at least 10 years. During an agricultural security area agreement, no nonagricultural development will be permitted on the property. 5. Agricultural security areas need to be at least 500 acres of contiguous farmland, have all landowners agree to enroll and be located in unincorporated areas of a township or county. An application must be filed with the county auditor, and the local governments must hold a hearing and pass a resolution approving the area. 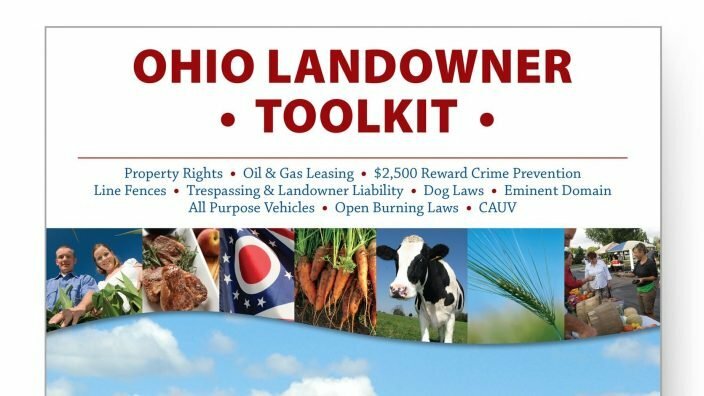 A full brochure on this topic is available online as part of Ohio Farm Bureau’s Ohio Landowner Toolkit, a 50-page booklet exclusively available to Farm Bureau members. It features detailed information about trespassing and landowner liability, oil and gas leasing, line fence law, open burning, dog laws and many other relevant topics.